Excerpt from Fred Williams Jr and Fred Williams III, History of Gate City II: "The Secretary for 1922 was a hard-working, active young man named William B. Hartsfield. A lawyer by education, he entered politics and served several terms as a city Councilman. Becoming disillusioned, he dropped out of the political arena, but was eventually persuaded to run for Mayor as a "reform" candidate. His campaign was successful, and he became one of Atlanta's most popular and progressive chief executives, serving, with one short hiatus, from 1937 until 1961. He saw aviation as a key to the future, and is credited with pushing Atlanta to the front as a regional air center. It is fitting that the city airport, one of the world's busiest, is named for him. (For many years, Bill Hartsfield's Executive Secretary at City Hall was Joseph Gregg, Jr., Master in 1914). " "William B. Hartsfield served as mayor for six terms (1937-41, 1942-61), longer than any other person in Atlanta's history. He held office during a critical period when the color line separating the races began to change and the city grew from more than 100,000 inhabitants to a metropolitan population of one million. He is credited with developing Atlanta into the aviation powerhouse that it is today and with building its image as "the City Too Busy to hate." 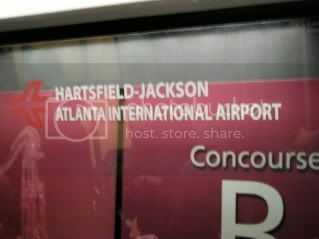 If having an airport named after him wasn't impressive enough, Willie B., yes, the Gorilla, was named after Hartsfield as well. Top that. Fernbank Science Center GACHIP event today!